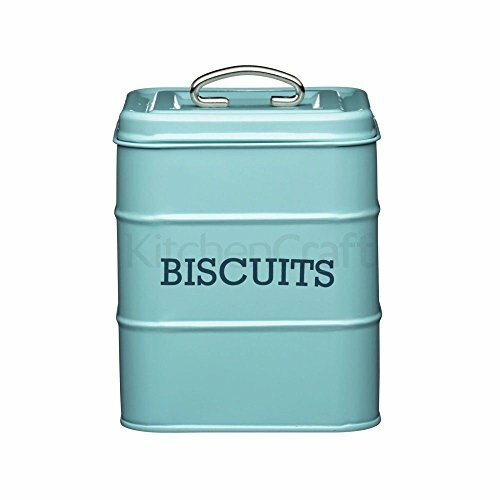 Deliciously fresh biscuits, stored beautifully in this antique styled vintage blue biscuit tin are certain to be popular with friends and family. Featuring beautifully printed exterior text clearly labelling the tin â€˜Biscuitsâ€TM, the tin forms part of the vintage Living Nostalgia collection. With a riveted steel handle for easy use, the tin is designed to maximise your worktop space and reduce clutter by occupying a nice and neat square footprint. When going back to basics, who is to say basic has to look basic? With beautiful functional forms, the Living Nostalgia collection sits seamlessly alongside both the Classic Collection from Kitchen Craft and their new collection, the Hen House. With a comprehensive selection of kitchen essentials in all collections, style your kitchen with vintage character and functional forms.